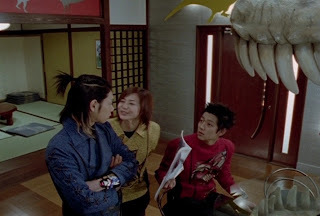 As Kyuranger comes to an end and we're just one episode away to the finale -- I just want to express my opinion on how or what I wish Don Armage was written in the series. I know that I do like the show but it doesn't mean there isn't some friendly criticism I'd like to give towards the series. One idea I wanted to happen is the idea of Don Armage is actually Cuervo -- or that Cuervo is a disguise of Don Armage. It's confirmed that the Cuervo that is Don Armage is but the villain possessing a dead body. I wanted it to happen where he disguised himself as Cuervo, fooled Tsurugi and decided to take away the immortality of the Phoenix. It could have been cool if he was given the concept that he could control multiple bodies like Grand Lord Crisis in Kamen Rider BLACK RX or Demon King Psycho in Sharivan. But they just decided to go on with him possessing dead bodies for some reason. Maybe, it's to avoid complicating things too much or executive meddling. Naruhisa Arakawa himself was someone who was pretty infamous for writing the Jetman Dryer Jigen episode. He also wrote one episode in Kamen Rider Black namely the episode where Bilgenia tried to crush Kotaro Minami's feelings for humanity. We can also think that he was also a secondary writer for Jetman (6 episodes), Zyuranger (7 episodes), Dairanger (11 episodes which included the Three Stooges Arc), Kakuranger (2 episodes), Carranger (13 episodes), Megaranger (12 episodes including the finale), Gingaman (4 episodes), Kamen Rider Kuuga (main writer with Toshiki Inoue as the sub-writer) and Hurricanger (8 episodes) -- all prior to his big debut as the head writer of his first Super Sentai series Abaranger. Kyuranger 47: Can The Kyurangers Stop The Countdown To Destruction? Yup, it's the final countdown to destruction for Kyuranger. We're in the second to the last episode and it's going to be intense. What amazed me was that everything wrapped up early last year as far as filming is concerned. So what's next? Don Armage is now absorbing the Planesium into himself in his plan to recreate the Universe in his image. 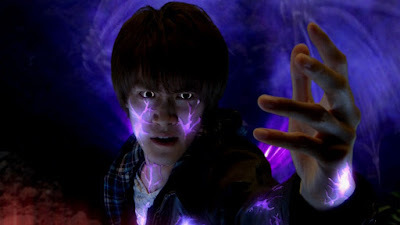 Earlier on, he already possessed the body of Tsurugi and now he's using it for his own power. I think Don Armage switches bodies for a reason -- all the host bodies will run out of their capacity to house his dark spirit sooner or later. I guess Cuervo's corpse' being a corpse couldn't hold much of Don Armage's essence so he shifts to another body. 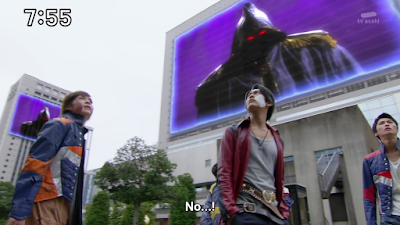 Gokaiger Episode 5: Judgment Pirates -- The Seed Of Lupinranger VS. Patranger? As Kyuranger comes to an end -- I want to recall once more Kaizoku Sentai Gokaiger's fifth episode which was a Dekaranger-focused one. The Gokaigers are searching for the Greatest Treasure in the Universe and they run across Jasmine, Doggie and later Ban. Knowing that Takaaki Utsunomiya is once again involved isn't a surprise either. Sure, he wasn't the top producer of Dekaranger (as it was Hideaki Tsukasa) but I guess he couldn't resist making that reference in his upcoming series. After all, he was the guy who was behind Kaizoku Sentai Gokaiger as its producer. Hope, despair... Haruto just where are you right now?! Kyuranger is coming to an end which brings your typical good news/bad news scenario. Good news is, it would be time for a new series (and hopefully, Lupiranger vs. Patoranger will be able to carry out its ambitious idea) but we're seeing some dark gates open. But what's a finale without them? The mission is clearly not easy. Don Armage inside Cuervo's body is going to use the Earth as a bomb. He's made sure it's well guarded and he won't take any chances. He wants to succeed and restart everything as he sees fit. The genius behind the plan is this. Don Armage wants to make sure that his plan succeeds so he has to keep it well-guarded. Both Lucky and Tsurugi managed to enter the headquarters to fight Don Armage. Kyuranger 45: Tsurugi's Life Or The Universe? Kyuranger 44: Don Armage Is... ? !